« Tie-Dye…. Enter a world of color! Yesterday after school we had a wonderful group of students stay after and create cake pops. The recipe was given to me by a friend who had found it at allrecipes.com – you can see the Cake pop recipe here. Ms. Duhring and I had the kids up to their elbows in chocolate dipping, and we forgot to take pictures because we were having such a great time! So next time we do this activity (on March 22nd) we will have to be sure to take pictures and post them for everyone to see. While this is not the most nuttritious recipe – It is a fun treat to make with all age groups – Here are a few pointers that I took from those who had made them already, as well as variations on them with different cake mixes to use and icings to add to them. Check them out and enjoy! 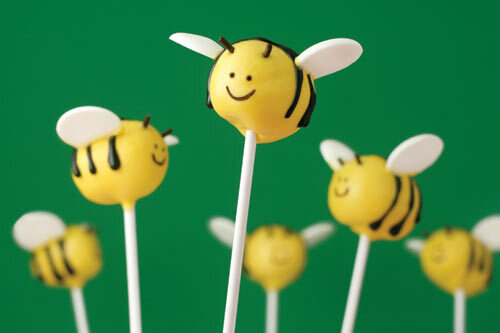 (I did find some other great cake pop ideas at bakearella.com – you can see those HERE) The pictures below are from there…. ENJOY! #2) Let the cake COOL for at least a half hour! Don’t mix in the frosting while HOT! You will get a gooey mess! #3) I used a hand mixer to mix the cake and frosting. I used a dark chocolate cake and cream cheese frosting. #4) Put this mixture in the refrigerator, covered, for at least 3 hours but I did it overnight and it was perfect. #6) Stick the balls in the freezer for an hour. #8) Using a toothpick, pick up the balls and dip in the chocolate. Using a second toothpick in the other hand help the ball slid off the toothpick. NOTE:If your balls fall off the toothpick into the chocolate they are not frozen enough. 9) Place in refrigerator to set. • White cake mix and mint chocolate chip icing – Dipped in chocolate confectioners coating. • French vanilla cake with white chocolate almond icing. – Dipped in chocolate confectioners coating. • Red velvet with cream cheese icing and vanilla confectioners coating. 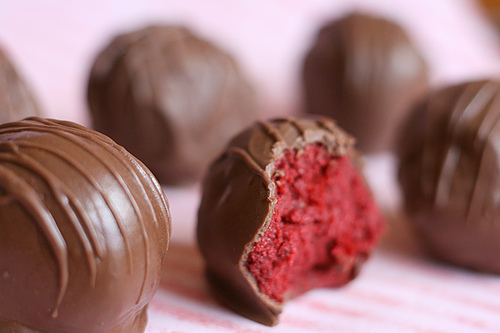 • Red velvet with cream cheese icing dipped into milk chocolate coating. • Chocolate cake, milk chocolate icing, dipped into chocolate bark. • Lemon cake with lemon frosting and dip them in white chocolate. • Lemon cake mixed in white chocolate chips and lemon frosting, dipped in white chocolate. • Spice cake with cream cheese frosting and coated them with white chocolate coating. • Cherry chip cake mix and cream cheese frosting dipped in white chocolate. • Fudge cake, mixed in peppermint chips and fudge frosting. Dip in dark chocolate. • Chocolate fudge cake mix and coconut pecan frosting dipped into chocolate. • Chocolate cake, butter cream icing, and dark chocolate coating. • Chocolate cake/chocolate icing and dipped into raspberry/chocolate chips are melted with a bit of oil. • German chocolate cake mix with coconut pecan frosting & dipped in melted semi sweet chocolate chips. • Strawberry with vanilla frosting, dipped in chocolate.